Robert E. Myers, J.D. LLM, is a veteran trial lawyer with over 35 years of experience and has tried hundreds of criminal, civil jury and non-jury trials to verdict in various state and federal courts around the country. Robert began his career as a prosecutor in the District Attorney’s office in Philadelphia and was also appointed Special Assistant Attorney General for the Commonwealth of Pennsylvania. He prosecuted various individuals and entities charged with homicide, organized crime, economic crimes, bank robberies and numerous other crimes. Robert then left the District Attorney’s office to represent individuals who were catastrophically injured in construction accidents, automobile/truck accidents, injuries caused by defective products and professional malpractice cases. Mr. Myers has specialized in representing injured railroad workers who have been employed by all of the major rail carriers, including various short line railroads, in the eastern portion of the United States. Robert has been admitted to practice in numerous state and federal courts across the country and is a member of the Pennsylvania, New Jersey and District of Columbia Bar Associations. He has been admitted pro hac vice to practice in the states of Maryland, New York, Massachusetts, Ohio and Indiana. Mr. Myers has also been admitted to practice before federal courts in Michigan, Illinois, Indiana, Pennsylvania, New York, Massachusetts, Connecticut, New Jersey, the District of Columbia, Maryland and Florida. Robert has the highest possible AV rating from Martindale Hubbell®. He is a union approved attorney for several railroad unions and a member of the Academy of Rail Labor Attorneys, and has been appointed as Designated Legal Council by the SMART Transportation division (formally United Transportation Union). Listed below are some of the verdicts and settlements obtain in cases involving Mr. Myers’ clients. Many cannot be listed because of confidentiality and non-disclosure agreements. $29,600,000.00 Our firm represented a number of individuals who were injured in the Pier 34 collapse in Philadelphia that left three individuals dead and of others dozens injured. $5,800,000.00 Settlement of $2,900,000.00 each obtained for two passenger conductors injured in a train collision who sustained various orthopedic injuries resulting in multiple surgeries. $3,500,000.00 Engineer injured in a train collision which resulted in lumbar and lower extremity injuries. $2,400,000.00 Chief Mechanical Officer for a shortline railroad who was injured when a pipe wrench exploded in his hands causing injuries to his lumbar spine. $2,400,000.00 Oil refinery worker injured at a Sunoco oil refinery during an explosion who sustained third degree burns and orthopedic injuries. $2,000,000.00 Engineer and two trainmen who were injured when a train collided into the rear of another train causing various orthopedic injuries. $1,750,000.00 Passenger conductor injured in a fall on ice in a yard who suffered head and shoulder injuries. $1,700,000.00 Engineer/Trainman employed by a shortline railroad who injured his low back while attempting to operate a defective handbrake. $1,700,000.00 Trainman who injured his lumbar spine after falling on an oily/defective area at the Meadows Maintenance Facility in Kearney, New Jersey. $1,500,000.00 Conductor/trainman injured using a defective cutting lever. $1,200,000.00 Elevator mechanic injured installing an elevator in the Philadelphia International Airport who suffered injuries to his cervical spine. $900,000.00 Railroad conductor injured using a defective handbrake sustaining injuries to his lumbar spine. $825,000.00 Injured engineer and conductor involved in a collision with other rail cars. $750,000.00 Female client who underwent an unnecessary hysterectomy procedure as a result of medical negligence. $500,000.00 Female client who underwent an unnecessary hysterectomy procedure as a result of medical negligence. $650,000.00 Trainman injured during an improper movement of a freight train. $500,000.00 Woman injured in a motor vehicle accident causing injuries to her cervical spine. 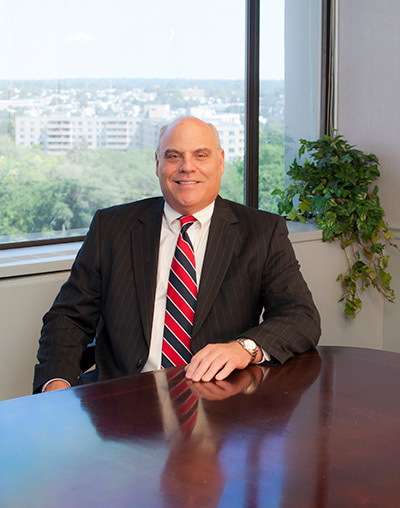 Mr. Myers has also represented numerous railroad employees who have been assaulted on passenger and freight trains resulting in favorable verdicts and settlements on behalf of his clients. Graduate Tax Program, Temple University School of Law, Philadelphia, Pa.
Columbus School of Law, The Catholic University of America, Washington D.C.